Dedicated to the study of the fairies in fairy tales . A Quick Guide to the Strange world of fairies. Art inspired by the greatest folklore in the world. An article on the fairy tales of tree fairies. 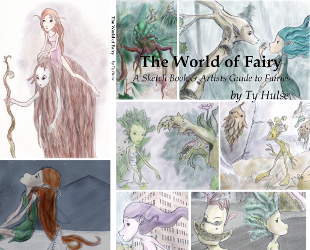 A children's book of Fairy Tales and Poems about fairies. You can get the e-Book for Free. A sketch book which takes a journey into the realm of the fairy using information from the best scholars on ancient beliefs and fairy tales. Fairies lend their good name to some of the greatest of tales, yet when many people search for the original meaning behind fairy tales the role that belief in fairies played in society is often forgotten. This is a guide to understanding what people believed fairies were so that you can better understand the fairy tales they inhabit. Pre-Christian, Muslim, Confucianism, Buddhism, etc. spirit/ ancestor spirit/pieces of a deceased deity’s spirit). Post-Christian, Muslim, Confucianism, Buddhism, etc. forced to live as a nymph until judgment day. the longer description of fairies on this page ignores it entirely. Peter Pan were being written. The word fairy can be tied originally to a general concept of "fatedness." (Williams, 1991). To the ancient belief that there are many millions of supernatureal beings which control human fate. Fairies were once seen as a series of spirits and souls of many types which can alter the course of human lives for better or for worse. Because they control human fate from secret it was believed that firies existed in a freer state then humans, able to to change shape, turn invisible, appear and disappear at will (Jacod Grimm). Becasue of their magical knowledge and capabilities fairies can be said to live in a hidden world along side the human world - living under stoves, at thresholds, within trees, rocks, mountains, caves, lakes, in invisible castles, underground worlds or realms in the sky. Read Article Relation Between Humans and Fairies. We see however that fairies are not necessarily superior to humans in all ways, along with believing that fairies were of a freer nature then humans Jacob Grimm asserted that many fairies lived in awe of humans, as humans existed in a realm somewhere between fairies and giants. Indeed many tales tell of humans capturing and tormenting fairies just as they tell of fairies capturing and tormenting humans. Despite this however one could also claim that fairies are those beings which humans stand in awe of but which have not yet achieved divinity. I would argue that fairies are defined by both a knowledge of nature such that they can manipulate the world, altering what humans would call fate as well as the ability to live within a parallel realm to that occupied by humans. Further their knowledge allows many fairies to be immortal such that many fairies are older then the gods, Zeus for example was raised by a nymph and Odin saught out fairies to obtain knowledge. The word for temple comes from an ancient Germanic word for wood because at one time the open glades of the forest acted as the temples for the Germanic, Slavic, Latin and Celtic peoples of Europe. Nature was both loved and feared by the ancient Europeans. The Romans would make sweeping motions in order to drive natural spirits from their homes yet would pray to trees for success. Celts threw items in wells or wedged them into trees in order to ask the fairies within for help but approached each carefully as the trees and wells would seek to kill them if they were not respectful. It has been proposed that Baba Yaga of Russia was once a wind spirit as was Mira of the Baltic nations. The Celtic fishermen of Britteny would throw knifes into the fog in hopes of driving it away and people all through Europe would give offerings to the frost to keep it from killing their crops. Perhaps the most common and important fairies were the water fairies. Still many more other fairies such as Black Annis and Jenny Green Teeth were gods of the Celtic people who were demoted after the Celts became Christian. In many myths humans are decended from deities and or fairies, in some ancient Greek Myths for example humans are decended from the nymphs of the ash trees while they were created from ash trees in Germanic mythology. No mater the mythological orgin of humans all humans share a close relationship with fairies in European Mythology. So close that fairies often kidnap humans in order to have children with them. Further humans are often able to become fairies, the Tuth De Dannon of Ireland the Pixies of Cornwall were both said to have once been human peoples forced into hiding. In Germanic legend their are humans who become elf kings and in Greek folktales girls have been taken away by fairies so that they would become fairies. Further fairies can become human, the Green Children of --- tells the tale of a pair of a fairy girl who eventually became human after eating human food over the course of a few months. What ultimatly seperates humans from fairies is knowledge which fairies have and humans don't. Knowledge which allows the fairies to manipulate nature, enter the hidden realms around humans, create illusions, change shape and turn invisible. This knowledge which is shared by fairies with their children and some few mortals is kept from most humans according to one Germanic dwarf because the fairies and deities don't trust humans. Zeus forbade giving humans fire for similar reasons and many European other myths assert that deities forbade giving humans too much power. The faces of dead loved ones were said to be visible among the trooping fairies and there are many Celtic tales of someone rescuing a dead loved ones soul from the fairy world. In a Russian version of the Cinderella story the protagonists mother grew into a tree which provided her with the gifts she needed to meet the prince thus having the girls dead mother take the place of the fairy god mother. All through Europe and the Eurasian steppes the souls of humans were said to inhabit trees. It was common to believe that ancestors who had died would continue to live near the family and help them with their problems. Domovoi the Russian household fairy was said to be an ancestor of the family who would help with chores, protect them from danger and wail when something bad was about to happen. Banshees too were an ancestor spirit which would cry when someone in their family was about to die. However the banshee was much more then a morning spirit, they would give their family members the gift of poetry, help them to develop strategies and offer advice. In many cases fairies were simply other beings, the dwarves, zwerge and elves had no relationship with humans and were not part of any natural phenomenon rather they were a separate species from humans. The Huldra or Vitra of Scandinavia are hollow women with no backs that live in an underground world of cities all their own who come to the surface to graze their cattle much as humans would. These separate beings do share many traits in common with humans and so we'll steal from, kidnap or imitate each others societies. In post-Christian Europe it was believed that many of the Pagan dead as well as the souls of unbabtizied babies would become fairies until judgment day. A third belief held that they were a class of "demoted" angels. One popular story held that when the angels revolted, God ordered the gates shut; those still in heaven remained angels, those in hell became devils, and those caught in between became fairies. Others held that they had been thrown out of heaven, not being good enough, but they were not evil enough for hell.This may explain the tradition that they had to pay a "teind" or tithe to Hell. As fallen angels, though not quite devils, they could be seen as subject of the Devil.